Explanation: In this beautiful celestial still life composed with a cosmic brush, dusty nebula NGC 2170 shines at the upper left. 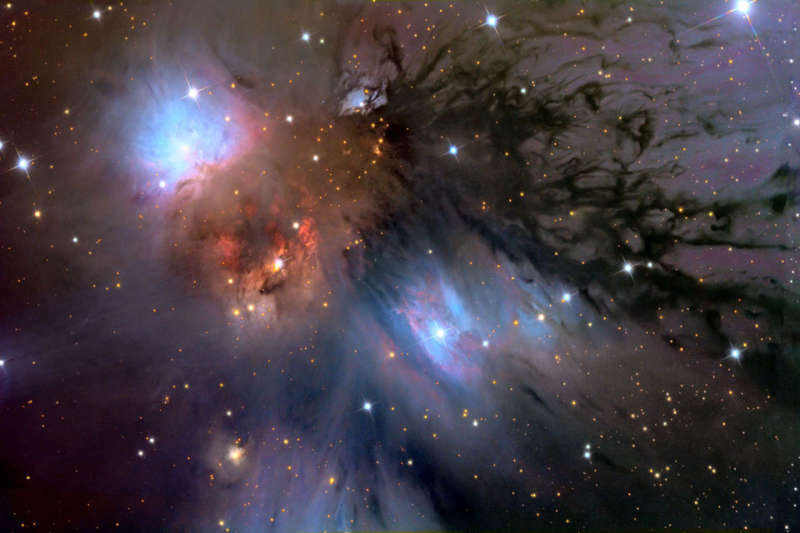 Reflecting the light of nearby hot stars, NGC 2170 is joined by other bluish reflection nebulae, a compact red emission region, and streamers of obscuring dust against a backdrop of stars. Like the common household items still life painters often choose for their subjects, the clouds of gas, dust, and hot stars pictured here are also commonly found in this setting - a massive, star-forming molecular cloud in the constellation of the Unicorn (Monoceros). The giant molecular cloud, Mon R2, is impressively close, estimated to be only 2,400 light-years or so away. At that distance, this canvas would be about 15 light-years across.